Jose Robledo (1875 – ca 1936). 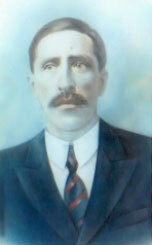 I know very little about my great-grandfather Jose “Joe” Robledo. He died before my Dad was even born, and only one of his children is still alive, so that has created some major brickwalls in my research. Family lore claims that his family was of Spanish descent. And the pale skin, pale hair, and pale eyes in the only photo we have of him lends credence to this story. I have no birth or death records for him. I don’t even know his death date — I only have an unconfirmed year from family recollections. I do know that he was born in Mexico, and that he lived in San Luis Potosi, but I have no idea if he was born in SLP or just moved there by the time he got married. I know that he did not immigrate to the U.S. with his wife Maria Nieto in 1915, but I don’t know when he came across the border. I did confirm about 11 years ago, through Census records, that he was already living in Long Beach, California by 1920, and that he was born around 1875 or 1876. This past week, I discovered his World War I draft card, which finally — through his own account — confirmed at least a few more details about Joe’s life. 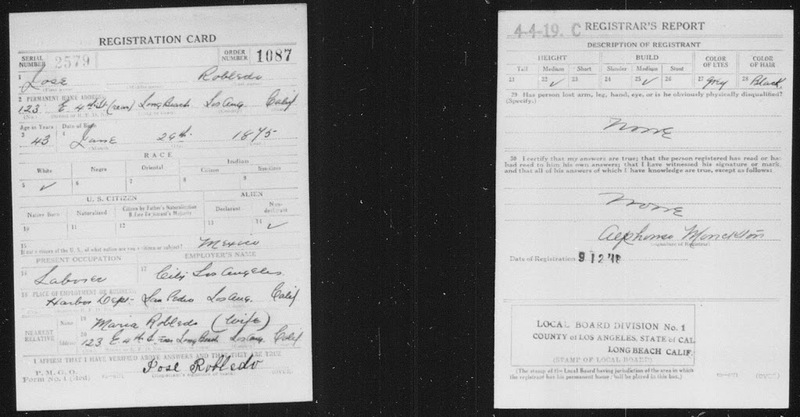 World War draft registration card for Jose Robledo, courtesy of FamilySearch.org. Click on the image to view a larger version. Despite not being a U.S. citizen (I don’t think Joe ever did gain citizenship), Joe, like all men up to the age of 45 was required to register for the draft between 1917 and 1918. Joe’s age group 18 to 45, fell in the third wave registered beginning September 1918. My great-grandfather Jose Robledo registered for the World War I draft at the age of 43 on September 12, 1918 in Long Beach, California — just under three years since his wife Maria arrived in the U.S. He listed his birth date as either June 26 or June 29 (it’s hard to read), 1875. He lists himself as a citizen of Mexico and a non-declarant alien (I guess this means he did not intend to become a citizen?). Jose was described as being white, of medium height and build, with grey eyes and black hair (that doesn’t match what our photo of him depicts), and with no physical impairments. On the draft card, Jose lists his place of residence at 123 E. 4th St. (in the rear) in Long Beach, California. He recorded his wife Maria as his nearest relative, living at the same address. Jose also indicates that he was employed as a laborer with the City of Los Angeles, working for the San Pedro Harbor Department. And, most exciting for me, I get to see my great-grandfather’s signature! A closer look at my great-grandfather’s signature. While this discovery provides some good useful details about Joe’s life, it also poses many more questions to be answered. Where in Mexico was he born? When did Jose immigrate to the U.S.? Why is he listed as a non-declarant alien? Didn’t Joe immigrate with the intention of gaining citizenship? Or was Jose hoping to return to Mexico with his family after making some money, or after the political situation in Mexico settled back down? 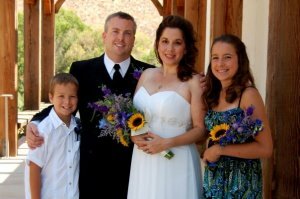 NOTES: Parents' names verified 14 April 2016. Birth year added 18 June 2015. It seems like all Robledo’s come from SLP. I’ll keep an eye out for him while doing my own research on my Robledo family. My Great Great Grandfather Ignacio Robledo was born in 1867 in Espiritu Santo, Zacatecas….but moved to SLP at some point because that is where some of his children were born. He eventually ended up in Fresno, CA…but that was after living in Texas for a period of time. Somehow I missed your comment until just now! Please do keep in touch.